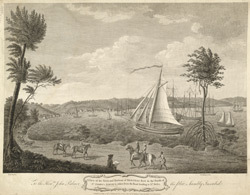 A view of Montego Bay town and harbour in Jamaica, published in 1770 by Spilsbury. Montego Bay was a trading port and the principal town of the parish of St James. The Spanish built a fort there in the early 16th century and called the area 'Bahia de Mantega' or Bay of Lard, because of the large quantity of pigs lard that was exported from it. This print was dedicated to the Honourable John Palmer, a wealthy plantation owner and Custos ('Guardian') of St James' parish who built the famous mansion Rose Hall on his estate near Montego Bay.